At Supersonic Festival 2012 we hosted a Q&A with Savage Pencil aka Edwin Pouncey ahead of the release of his ‘Trip or Squeek’ publication, a collection of comic strips that have featured in the Wire since 2002. 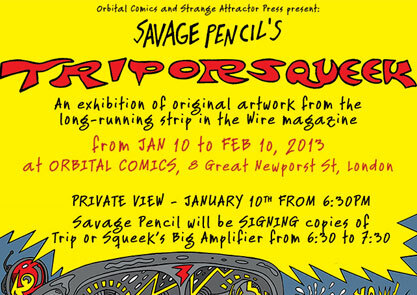 You can see an exhibition of the original Trip or Squeek artwork at London’s Orbital Comics 10th January – 10th February. One of Savage Pencil’s comic strips was about Home of Metal – quite an honour!